Using new technology, some doctors -- particularly in rural areas -- are doing video office visits. A number of companies have sprung up, such as MDLiveCare, that offer consultations via real-time video. But mobile video is going even a step further. Faster connections over newer cellular networks -- commonly called 3G and 4G, respectively, for third-generation and fourth-generation mobile telecommunications technology (3G and 4G refer to the speed of the network the phone is connected with) -- also are enabling wider use of mobile video in healthcare. Andrew Barbash, MD, head of the neurosciences and stroke program at Holy Cross Hospital in Silver Spring, Maryland, uses the free Google Talk application on his smartphone to conduct video consultations with patients and clinicians in the emergency department when he's on call but not physically at the hospital. "The mobile phone becomes kind of the enabler," Barbash says. Joseph Kim, MD, MPH, curator of MedicalSmartphones.com, believes this is just the beginning. "You will see more patients communicating with doctors via telemedicine," he says. Touch-screen tablet computers are creating a new class of totally cool and incredibly useful gadgets and applications that are helping to make life easier for physicians and their patients. Let's face it, Apple's iPad has taken medicine by storm. 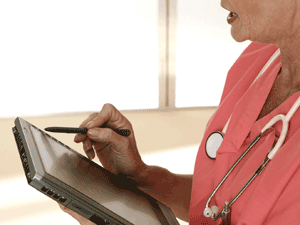 Research firm Knowledge Networks reported in March 2011 that 27% of physicians in the United States had a tablet-style computer, or about 5 times the general public's adoption rate. That study didn't break down tablet usage by platform or model, but healthcare industry analyst Chilmark Research estimated that 22% of all physicians in the United States were using iPads at the end of 2010 (Sharma C. "mHealth in the Enterprise: Trends, Opportunities and Challenges." Chilmark Research, November 2010). Tablets in general and the iPad in particular are more than just oversized smartphones without the phone. They have processing power to rival that of desktop computers. Some of the smaller models -- the Samsung Galaxy Tab and the BlackBerry PlayBook -- fit into the pocket of a lab coat. And they have touch screens. "Whenever you're in a remote environment, it's much easier to draw things up than to try to explain on the phone," says Kim. Iltifat Husain, MD, Editor-in-Chief and founder of the iMedicalApps.com blog and a new graduate of Wake Forest University School of Medicine, is bullish on speech recognition as a breakthrough technology that makes physicians' lives easier. "I think that doesn't get enough play," he says. It's already easing the transition to electronic medical records (EMRs) by helping physicians document cases and changing medical transcriptionists into higher-skilled editors. Husain says he is looking forward to the day that Nuance Communications comes out with a version of Dragon Medical speech recognition software that supports real-time voice dictation on mobile phones. "The beauty of real-time mobile speech recognition is that the physician no longer needs a keyboard," Husain says. He notes that one company, DrChrono, already makes an EMR specifically for the iPad that includes real-time mobile dictation. Goodbye to what has been the symbol of physician care for almost 200 years. "In 2016, doctors aren't going to be walking around with stethoscopes," cardiologist Eric Topol, MD, Director of the Scripps Translational Science Institute, Chief Medical Officer of the West Wireless Health Institute in La Jolla, California, and Chief Academic Officer at Scripps Health in San Diego, said at the Consumer Electronics Show in Las Vegas. "There’s a whole lot better technology coming." Topol called the handheld ultrasound the "new stethoscope," something that will become a must-have device for physicians. In 2009, GE Healthcare introduced the Vscan, an ultrasound visualization device that looks like an oversized cell phone with an attached scanning probe. The Vscan costs about $8000, but that price is expected to come down as the technology improves. Another company, privately held Mobisante, this year gained US Food and Drug Administration (FDA) 510(k) clearance for a similarly priced ultrasound system that runs on a Windows-based Toshiba smartphone. The Holter monitor is also on its way out. Topol has called it, "another obsolete technology, soon to be buried." It just contains too many wires and is uncomfortable to wear. Instead, Topol said, patients with serious chronic ailments such as congestive heart failure ought to be wearing a "smart bandage," an adhesive patch containing an array of sensors that measure vital signs. It's a technology that patients can even take home with them. Wireless transmitters in the bandage send readings either to a patient's smartphone or an Internet gateway such as an in-home wireless router, creating what's known as a "body-area network" that keeps constant tabs on people who might otherwise require hospitalization. Though cell phones are pretty much ubiquitous in society and smartphones have proliferated in hospitals, far too many clinicians haven't been able to ditch the old-fashioned pager. But some companies are trying to eliminate the need for multiple devices by promoting what they call unified communications. For years, Vocera has offered wireless voice-over-Internet protocol (VoIP) phones that send paging, voice, and text messages to portable handsets within a hospital or clinic. So you can get a portable handset that will still page you but also provide other services, including voice and text messages. In the past couple of years, a Sarasota, Florida-based startup called Voalte (pronounced "volt") has packaged similar technology to run on the user's own smartphone, with a single phone number for all communications. Some software developers have seized the power of the Apple iOS (iPhone) and Google Android operating systems to design apps that effectively turn smartphones into low-cost medical devices, helping to create a new category of mobile diagnostics. In June 2010, the FDA cleared DiabetesManager from Baltimore-based WellDoc, a blood glucose measuring system that links to a mobile phone app so patients with type 2 diabetes can collect, track, and share readings with health professionals and learn how to better manage their conditions. Three months later, AgaMatrix of Salem, New Hampshire, won premarket approval for its WaveSense Diabetes app for the iPhone that analyzes data from the device maker's Jazz glucose monitor. Researchers at the California Institute of Technology have even created a lens-free microscope using a $1.50 digital camera sensor that connects to a smartphone to help remote health workers diagnose malaria in developing countries. Others have created apps that mimic the functionality of a stethoscope by listening to the heartbeat through a smartphone's microphone, but that approach doesn't work for everyone, according to Husain. "People should be careful when using applications like that," says Husain. "There is a whole host of variables where you can't use that." For example, Husain says it is difficult to get an accurate reading on overweight patients without an external stethoscope attachment. "Smart" pill bottles can emit light and sound when it's time to take a pill and send automatic alerts to caregivers if the patient skips a dose. That gives physicians a new way to monitor medication adherence in populations with chronic disease. Automated text messages can serve a similar function. This is such a promising area that biotechnology billionaire Patrick Soon-Shiong, MD, recently purchased Vitality, maker of the GlowCap wireless Internet-connected medication bottlecap. Mobile medical reference apps, including Medscape's, have been around for years, but they're becoming more timely and functional. In April, Canadian mobile software vendor QxMD apparently made history by releasing an update to its Calculate by QxMD app to incorporate new scientific knowledge about the risk for renal failure and the need for dialysis in patients with chronic kidney disease at the same time a Tufts Medical Center researcher publicly presented the evidence. Husain is a fan of a free medical translator called MediBabble. "This is a terrific app," he says, noting that it's particularly useful in international disaster relief. MediBabble is a history-taking and examination application designed to improve the safety and efficiency of care for non-English-speaking patients. Facebook has captured the imagination of the world, claiming 500 million active users, half of whom log in on any given day. You can be sure that plenty of physicians are among those masses. But where do you go when you want to discuss medicine or simply connect with other doctors? LinkedIn, a business-focused networking site, has at least 100 million users worldwide, but there are several social and professional networking sites just for healthcare professionals, some of which offer secure communications suitable for colleagues who already know each other to discuss specific cases. (Medscape's discussion boards are popular landing spots for physicians). For patients, there's an emerging field called participatory medicine. A group called the Society for Participatory Medicine defines it as "a cooperative model of healthcare that encourages and expects active involvement by all connected parties (patients, caregivers, healthcare professionals, etc.) as integral to the full continuum of care." Patients facing serious health challenges have been flocking to sites such as Organized Wisdom and PatientsLikeMe.